Call it vintage Tiger Woods. 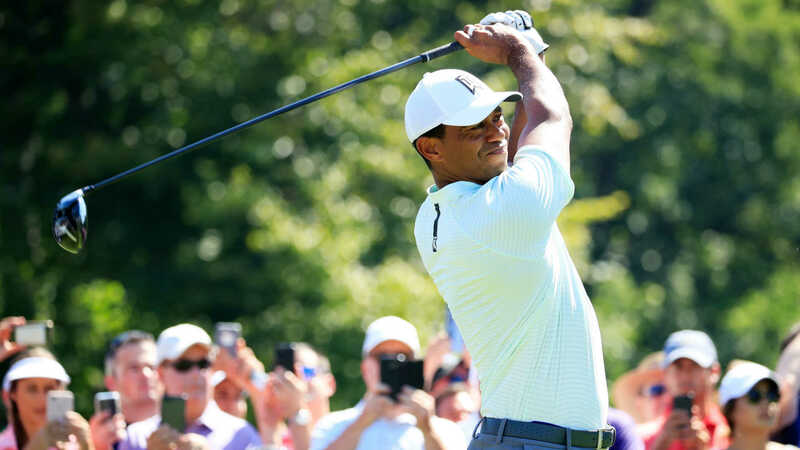 Fresh from being named a captain’s pick for this month’s Ryder Cup in France, Woods threw darts at pins for a sizzling 6-under 29 on his first nine of a sun-splashed Thursday and rode the fast start to an 8-under 62 and leader-in-the-clubhouse status in the first round at the BMW Championship. Starting on No. 10 in a marquee group with Jordan Spieth and Rickie Fowler, Woods, 42, carded four birdies and an eagle in his first nine holes at Aronimink Golf Club in suburban Philadelphia for a two-shot lead as he made the turn in the last FedEx Cup Playoffs event before the Tour Championship in two weeks. As Woods was finishing, Rory McIlroy was busy fashioning an equally impressive round, also having started on the back side. McIlroy was a 8-under through 13 holes. Fowler, meanwhile, was nearly as hot, posting a 65 on the par-70 layout and was three shots back after Round 1 while most players were still out on the course. Woods’ 29 matches his second-lowest nine-hole score in competition, bettered only by a 28 he shot in the 2007 Tour Championship, seemingly a lifetime ago for the 14-time major winner who only this year has rebounded following a third back surgery that apparently has solved years of back issues. Woods added a birdie at No. 1 to go to 7-under on the day before losing some momentum with a string of five consecutive pars. However, he snapped that streak in dramatic fashion, dropping a wedge to inside a foot at the 396-yard par-4 seventh hole for a tap-in birdie that took him to 8-under for the day. But he immediately gave that shot back with his first bogey of the day when he was long and left off the tee on the 246-yard par-3 eighth hole and his 16-foot par putt slid past the hole. This day, though, was about a first nine that set the stage for Woods’ dramatic day and rekindled memories of the player who dominated the world rankings and appeared a real threat to break Jack Nicklaus’ record of 18 major victories. His bogey-free opening side got off to a roaring start as he birdied three of the first four holes. Still, an iron into the 556-yard par-5 16th that stopped some five feet from the hole was the shot of the side. He calmly rolled in the eagle putt — one of only 13 putts on the nine — to get to minus-5 and then added his final birdie on the par-4 18th to get to 6-under, despite having hit only four of seven fairways. Woods hasn’t won a PGA Tour event since the 2013 WGC-Bridgestone Invitational but has steadily climbed the world rankings in his most recent return from back problems.